Publisher : dragonfly publishing, inc. Ignoring his runny nose and worsening cold, Matt's single-minded pursuit of a rare bug wreaks havoc on his school, his teacher, and his classmates. For me, all of my writing inspiration comes from my two boys. They constantly crack me up and have such a fresh take on the world. In fact, the idea for The Bug That Plagued the Entire Third Grade came to me when one of my sons had that dreaded stomach virus every parent dreads. When everyone asked how he was doing, I would say, “He caught the bug.” It's something everybody says when they're sick, but the more I said it, something clicked. So I expanded on the play on words of catching a bug--meaning getting sick and catching an insect and "The Bug" was born. "Reading the story will surely bring a huge smile to your face, just like it did me, because it reminded me so much of similar adventures my three children and their friends experienced during their elementary years in school. Every elementary school should have a copy of this precious book in their school library." "Will Matt succeed and convince his teacher that he truly captured an unusual bug for real or will he be sent home because he caught the cold bug? 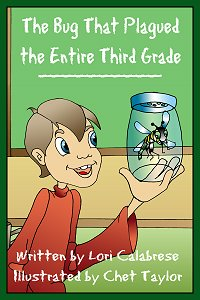 Find out while you read the hilarious tale of The Bug That Plagued the Entire Third Grade told in perfect rhyme." "This wonderfully animated and colorful book will have readers turning the pages to see what happens next. The rhyming will send your tongue twisting and bouncing with every word. Parents and teachers will love this book along with anyone who loves a bug adventure. " 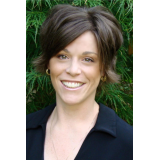 "Lori Calabrese's The Bug that Plagued the Entire Third Grade is a fun story for young readers about a boy and a bug, a natural combination...As a former third grade teacher I can relate to the teacher's concern about spreading the cold bug. I recommend the book for children in first through third grades, along with their parents and anyone who knows little boys (or girls) who like bugs. Or even for the kids who think bugs are creepy. After reading Ms. Calabrese's story, they may decide bugs are pretty cool. A very nice debut book."